All communications will reference your FULL callsign and not just "two"
Air taxi or commercial operators without FAA authorized Callsigns prefix with "tango"
"Dayton tower, Fleetwing One Two Three Four, student pilot"
Because of the priority afforded air ambulance flights in the ATC system, extreme discretion is necessary when using the term "MEDEVAC"
Pilots should be especially watchful and avoid the flight paths of any aircraft using the call sign "Flight Check"
Call signs should never be abbreviated on an initial contact or at any time when other aircraft call signs have similar numbers/sounds or identical letters/number; e.g., Cessna 6132F, Cessna 1622F, Baron 123F, Cherokee 7732F, etc. 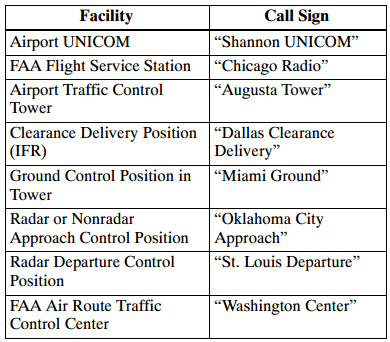 Air Taxi or other commercial operators not having FAA authorized call signs should prefix their normal identification with the phonetic word "Tango"
Examples include Army Copter 48931; Air Force 61782; REACH 31792; Pat 157; Air Evac 17652; Navy Golf Alfa Kilo 21; Marine 4 Charlie 36, etc. "Air Cal Three Eleven, United [Interchange/Lease], Boeing Seven Two Seven"